It’s still only early November and while Christmas is still over 6 weeks away you can walk into any store and find the sights (and maybe sounds) of the holiday season all around you. I’m not sure of the exact day it started, but the Starbucks in our building has had their red Christmas cups out for a few weeks, along with the usual window decorations, and of course the Christmas coffee blend. Starting November 15, you’ll be able to bring those red cups (and apparently 47 other Starbucks products) to life using the Starbucks Magic Cup app. 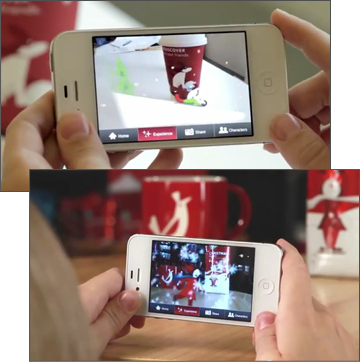 Use your camera phone to focus the app on the cup and you’ll see short animated clips appear on your screen. If you’ve been in a Starbucks recently you’ll recognize the characters (an ice skater, a boy and dog sledding, a fox and my favorite a squirrel) from the door clings, cups and packaging. Tap on the screen and you can interact with the characters. Collect all five characters and you qualify for a prize. The app also features holiday ecards and special offers from Starbucks. The Starbucks Cup Magic app was created by Blast Radius and will be available for iPhone and Android on November 15. 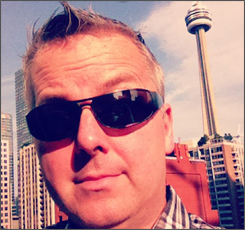 I am a Nova Scotia raised Creative Guy, currently Director of Emerging Media at Delvinia, a Digital Strategy & Customer Experience Design Firm in Toronto. I’m a huge fan of the creative use of digital technologies in social media, marketing, sports and entertainment. I use this blog to share the more interesting examples that I find. If you’re in need of a break, join me over at Madtini.com for a cocktail.